Is your bathroom faucet leaking from the spout, the handle, or the base? Are you ready to replace your bathroom faucet? Would you like to know how to go about it so that you don’t have to pay a plumber a lot of money, and have a stranger trapesing through your personal space? Are you a rehabber or a house flipper that wants to do some of the updating of your homes yourself? Or do you just want to know how to do it so you can teach your workers? Do you work for a rehabber or a flipper? Are you a handyman that needs to know how to perform some plumbing repairs and replacements? If any of these scenarios fit you, or if you know someone that it does, this information will be of benefit. Be sure you have the right tools to do the job. Before you can attack any plumbing repair of replacement, you will need some tools and supplies. Some of these tools may not be needed, depending on the particular repair or job that you are attempting to undertake. But, to account for all possible situations, I will describe every tool that could possibly be needed for repair or replacement of a bathroom faucet. If you are a rehabber, a handyman, a maintenance man, or any type of plumbing professional, you should of course have all of these tools and supplies. Screwdrivers – Good idea to have both a Phillips Head, and a Slotted Head screwdriver handy. Handle Puller – This handy tool makes it easy to remove a stubborn faucet handle. Adjustable Wrench – A must have for loosening nuts and valves. Pipe Wrench – This heavy duty tool is for jobs that require leverage and strength. Normally not needed for bathroom faucets, but may be needed for related shut off valves, or issues with pressure pipes. Basin Wrench – For loosening and removing nuts from under the sink. Socket Wrench – Useful for removing valves from faucet bodies. Pliers or Adjustable Pliers – A must have for many possible uses. Teflon Tape – Needed for water tight seal on threads, such as at the bottom of valves. Plumbers Putty – Also provides a watertight seal. Many possible uses, but normally used to seal base of faucet to sink. Seat Wrench – Shaped like a boomerang, this tool is used to remove seats from the base of the valve. Seat Grinding or Polishing Tool – Used to smooth out the surface of a pitted or chipped valve seat. Plumbers Grease or Lube – Used to provide a slippery surface to reinstall valves, and other uses. O Ring Pick – Used to remove o rings from valves. Allen or Hex Wrench Set – For Allen or hex screws in single handle faucets. Putty Knife – For scraping surfaces. Buckets and Sponges – Always have these handy for those untimely leaks, spills, and drips. First find out where leak is coming from. 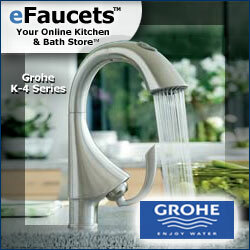 The most common issue with bathroom faucets is of course a leak. Where the leak is coming from though is the most important thing to consider, and will determine how you go about the repair. Before you attempt to repair your bathroom faucet however, you should locate the main water shut off valve for the house. This is normally in the basement. Look for a shut off handle that is in close proximity to pipes(usually copper)coming into the house. By knowing where the main shut off is, you can protect yourself from a calamity that could happen while attempting a repair, such as from a busted or corroded pipe, a shoddy valve or supply line or any number of other unforeseen circumstances. If all else fails, you can shut the water off at the main to stop any leak. Close the drain stop so that you will not lose any screws or other parts down the drain. When you experience a leak from the faucet or spout, put your finger under the leak or drip from the spout. If the water is warm or hot, it is most likely coming from the hot side. If the water from the drip is cool or cold, it is likely coming from the cold side. You next step is to look under that sink for a shut off valve that corresponds to either the hot or the cold side, depending on the temperature of the water from the drip. Be sure that the shut off valve under that sink is securely shut off. If after turning the shut off valve off under the sink, you still have drips or leaks, you will need to turn the water off at the main shut off valve that comes into the house. This is usually in the basement. Once the water is shut off turn the faucet handle at the top of the sink to the on position to bleed any residual water in the line. Next, take a slotted head screwdriver and pry the H or C button off the handle to expose the top of screw. You should see the top of a Philips head screw or a Slotted head screw. Leaks from spout usually come from a chipped or pitted valve seat or a bad cartridge. Unscrew the screw using the appropriate screwdriver, and remove the handle from the valve. If you have trouble removing the handle, you should put a handle puller into service. Once the handle is removed, you should see the top part of the valve. Unscrew the valve from the base of the faucet using a wrench or pair of pliers. Inspect the bottom of the valve. You will likely see the seat washer is furrowed or damaged, or missing. The cause of this furrowed or damaged seat washer is the valve seat that it sits on. Be sure that the base of the valve is not damaged. If not, you can either attempt to remove the seat from the faucet, or grind down the seat with your seat grinding tool to smooth out the surface of the valve seat. To remove the valve seat use the seat wrench. If you are successful in grinding down the valve seat, you will only need to replace the seat washer. If you are not familiar with the sizes of these washers, bring the entire valve into the plumbing supply or hardware store, so you can buy the correct size. If you removed the seat, you will need to bring the seat and the valve into the plumbing supply or hardward store to get the correct seat and seat washer. Reinstall the seat and/or seat washer, and the valve. Put the handle back on the top of the valve and screw the handle to the top of the valve. Put the H or C button back on. Many newer faucets do not have seats or seat washers. 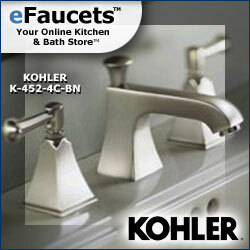 These faucets are designed so that the entire valve or cartridge will need to be replaced. You can usually tell by the fact that the valves or cartridges are made of plastic. Turn the water on from the shut off valve under the sink. Turn the water on at the faucet on the side that you just worked on. Check to make sure that there are no leaks either under the sink, or at the faucet at the top of the sink. This should fix the leak, and if you have done things correctly, 9 times out of 10 you should be good to go. If is doesn’t fix the leak, recheck things to be sure they are on, or screwed in properly. If this still hasn’t fixed the leak, it is likely time to buy a new faucet, or call a plumber. If the leak is coming from under the handle, shut the water off under the sink from the side where the leak at the handle is. Remove the handle by prying off the H or C button, unscrewing the screw at the top of the handle, and removing the handle. Again, if the handle doesn’t come off on it’s own, you will need a handle puller help you do the job. Remove the handle, unscrew the valve, and inspect the o ring (a black rubber ring) on the side of the valve. Chances are good that the o ring is flattened, damaged, or missing. Using your O Ring pick or an ice pick, remove the o ring from the valve. Your local plumbing supply or hardware store will have the parts and tools you need. Take the old o ring into the plumbing supply or hardware store, and match up it’s size to buy a new one. You may have to buy a package of several different sized o rings in order to get the one you need. It’s a good idea to also bring in the valve to be sure you buy the right sized o ring. Reapply the new o ring onto the valve. Coat the outside of the o ring with plumbers grease or lube. Reinsert the valve into the body of the faucet. Reinstall the handle, and the button. Turn the water back on from under the sink, or at the main if needed, and check to see if there are any leaks. This should fix the leak at the handle. If it does not, recheck everything to be sure it is on and affixed correctly. If the leak continues, you can try replacing the entire valve. This should only be needed if the valve is old or damaged. If this still doesn’t fix the issue, it’s time to buy a new faucet. If you have a leak from the base or the bottom of the faucet where it meets the sink, it is normally caused by a hole in the body of the faucet. It is possible though that the leak could be eminating from one of the valves. You will need to shut the water off under the sink for both the hot and cold side. Once the water is off, you will need to unhook the supply lines that lead up to the bottom of the faucet from the shut off valves. It is easier to unscrew the supply lines at the shut off valve than to attempt to where they attach at the bottom of the faucet. You will then need to remove the nuts that secure the faucet to the sink. These are found under the sink. You may need a Basin Wrench that adjusts to give you leverage. Pull the faucet off and inspect the entire body of the faucet. If all this checks out ok, you can try to put a rim of plumbers putty on the inside rim of the faucet where it will meet the sink. Reattach everything and test. If leaks still appear, it’s time to look for a new faucet. If you see severe corrosion, or a hole, or both, it’s time to buy a new faucet. If the faucet appears to be in good shape, you should look to see if one of the valves may be causing the issue. Inspect the valves, and the surrounding area for evidence of deterioration. If you find problems with the valve or valves, replace them, reattach everything, and test. If this doesn’t fix the problem, which it should, again it’s time to find a new faucet. Single handle bath faucets require different repair techniques. Single handle faucets such as Moen, and Delta, two of the most popular brands, require different repair techniques than the 2 handle faucets described above. Close the drain stop so you will not lose any screws or other parts down the drain. Moen, for instance uses a cartridge to control these faucets. If you experience a leak from either the spout, or from the handle, you will need to buy a new valve. It is relatively easy to replace the valve. Shut the water off under the sink. Using your Allen or Hex wrench, unscrew the screw that is on the body of the faucet. This may be under the Moen emblem, depending on the faucet model. Pull the handle off the faucet. Unscrew the screw that is holding the various pieces in place. Remove or unscrew the various pieces, including the retaining clip to get to the cartridge. Remember the sequence that these pieces are placed in the faucet. Once all of the pieces are removed(there may be one piece or several), use a pair of pliers to pull the cartridge out from the body of the faucet. Remember the position of the cartridge when you pull it out. Clean the area of any debris or dirt. Take the cartridge to your plumbing supply to be sure you buy the exact one. Install the new cartridge. Replace all of the pieces, and screws in the proper order. Turn the faucet back on from under the sink. This should fix any leak. If it doesn’t, inspect to be sure everything is in it’s proper place, and installed correctly. If so, and you still have a leak, time to seek a new faucet. Delta faucets use a ball, and a set of washers, springs, and o rings. Turn the water off under the sink, both sides. Use your Allen or hex wrench to remove the Allen or hex screw holding the handle onto the faucet. Pull the handle off the faucet. You may need a special Delta tool that comes with their repair kits in order to unscrew the large retaining nut, and access the interior of the faucet. Purchase the complete repair kit, and remove the large retaining nut. Pull out the black piece that has the arrow shape in the middle. Then remove the ball, and the washers and springs. Pay attention to the position of these pieces. Replace the old pieces with the new pieces. Reattach, and turn the water back on to test. This repair should fix both a leak from spout as well as a leak from the handle of the faucet. If it does not, time to shop for another faucet. There are other brands of single handle bathroom faucets. Most of the repairs will be similar to these described above, but some will not. Look for the instructions included with the faucet, if you have still have them. If not, go to the manufacturers website for repair instructions, or check Google, and YouTube for more possible information. Replacing a bathroom faucet is usually more involved than repairing a bathroom faucet. It is however, not difficult in most cases. First, shut the water off on both sides under the sink. Once the water is shut off, go up to the top of the sink and turn both the hot and cold sides on to bleed the lines. This will minimize the amount of water that will be left in the lines. If all else fails, a plumber is just a phone call or an email away. Then, unscrew the supply lines at the shut off valves. Next, from underneath,unscrew any nuts or bolts that are securing the faucet to the sink. You may need your basin wrench in order to do it. Then, also from underneath remove the connector on the drain stopper. This may require unscrewing a nut at the drain stopper to remove the small rod and ball. Depending on the type of faucet, you may also have to unscrew the knob at the top of the drain stop rod, and pull the rod out. Next, unscrew the nut on the P trap that holds the drain stop assembly. The P trap is usually white plastic, and the drain assembly is usually chrome. Then, at the center of the sink, remove the drain stop assembly by prying the edges until it comes loose. It may take a little elbow grease if there is hardened plumbers putty. Then unscrew the rim, and pull the assembly out from underneath. Next, from the top, gently pry the base of the faucet from the sink. Pull the faucet off the sink. Clean the surface of the sink to remove all dirt, hardened plumbers putty, etc. I recommend buying new supply lines unless your existing supply lines are new or next to new. Be sure to take your old supply lines into the plumbing supply so that you can match the size at the bottom connection for your new supply lines, as this size can vary. The top side of the supply line is always the same size. Take your new faucet, and apply a ring of plumbers putty around the inside edge of the base of the faucet where it will sit on the sink to give a watertight seal, and provide added adherence. Next, take some teflon tape, and wrap a few times around the faucet supply line threads. The teflon tape will provide a watertight seal. From the top of the sink, feed the supply lines through the holes on the sink. From under the sink, screw in the nuts that secure the faucet to the sink. Insert your drain stop assembly into the hole in the sink, and connect it to the rod so that it opens and closes properly. Reattach the drain assembly to the P trap. You may need a new washer for the inside of the P trap nut to ensure a watertight seal. If the P trap is old, it may also be a good idea to replace it, as well. Note: If you buy the exact same faucet, you may be able to continue to use the same drain assembly, although it likely won’t look good with your new faucet. Then, apply some teflon tape to the threads on the shut off valves. Attach the bottom of the supply lines to the shut off valves. Be sure that all of your supply line connections are nice and tight. Turn the water back on at the shut off valves. Go to the top and turn the water on at your new faucet to test. Be sure there are no leaks anywhere. Also, check to be sure the drain stop assembly is opening and closing properly. Also, be sure that your new faucet is securely fastened to the sink. Keep a close eye on your new bathroom faucet installation for the first few days to be sure there are no leaks, or other issues. Most bathroom faucet repairs, are fairly simple. However, on occasion, you may run into issues that are difficult to deal with. Bathroom faucet installations are a bit more involved, but usually not difficult. If you have any questions about either repairs or installations for your bathroom faucet, you can usually find the answer online on Google, and/or on YouTube or on the manufacturers website. If you deem it still too involved, risky. or difficult, you can always call a plumber. Order your Voice-activated Toilet from eFaucets.com today! Omg. I can’t believe I came across this post when I was JUST talking about purchasing a fixer upper. My plans are to move in and do one job at a time while I’m living there…so, obviously no homes with the roof gone. lol. Thank you for not only the great instructions but also providing a list of tools that I would need to do this. The videos are really helpful as well! I’m going to book mark your website for sure for my near future fix ups!